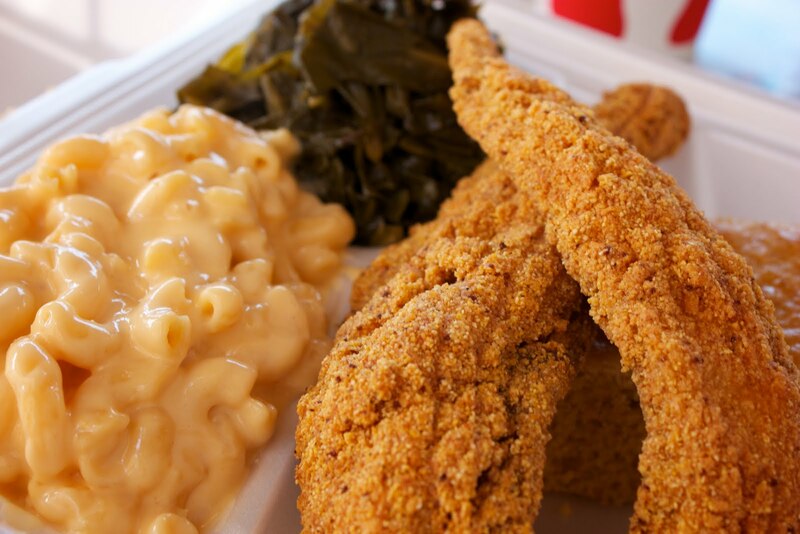 You Can’t Spell “Southern Food” without S-O-U . . . well . . .
Last month I read an article about a “soul food” controversy in a Northern California school district. When I read about the foods that were so controversial, however, I thought, “This doesn’t seem all that different from ‘Southern’ food.” Although there may be some general differences insofar as how soul food is seasoned and prepared, seasoning and preparation standards can vary widely from person to person. By in large, it seemed to me that we call a certain category of foods “soul food” when we say it comes from the black community, and then we call that same assortment “Southern” when we think of someone like Paula Deen making it. Food comes from the land, and people in both the black and white communities in the South, living on the same land, draw from the same staple foods that the land produces when deciding what to make for dinner. Since people don’t usually talk about the white community as its own particular community or race, we normally just label the food that white Southerners might prepare or eat as “Southern.” From this perspective, soul food is either “black food” or the black version of Southern food, since the roots of African American culture lie primarily in the South. For the most part, however, black people and white people in the South eat most of the same stuff. Though there may be some general tendencies that make soul food a little distinct from more Euro-centric varieties of Southern food, the biggest differences lie within the regional or even familial variations within each of these categories. Take collard greens for example. Collards are the type of greens that anyone in the South might eat at one point or another, regardless of race, although they’re more associated with the black community than with the white, making them more of a “soul” food than just a “Southern” food (even though you would still include them in Southern food). I grew up in a black family in the South, yet despite eating the traditional staples from time to time, I never ate collards growing up. I don’t remember even trying them until I was a teenager and had the chance to order them from a soul food restaurant. My mom’s family is from southwestern Mississippi, and when I would visit my grandmother’s house there we’d normally eat mustard greens. She made collards too, though normally just for other people. “Mustards” were her signature greens dish, and whenever family gathered for special occasions she would cook mustards picked from her garden. Mustards are part of “soul food,” although they’re not as common in soul food restaurants as collards. They’re also just a common leafy green vegetable in the South, however, and whether you call them soul food or Southern food, they’re cooked pretty much the same way: de-stemmed and stewed with bacon, ham hocks or turkey neck for hours. Even though collard greens and mustard greens lean more toward soul food than just Southern, the majority of vegetables people eat are common to both categories and don’t particularly lean “black” or “white.” I remember grandma’s garden also having green peas, string beans, black-eyed peas, cucumbers, butter beans (lima beans), peanuts, corn, and a number of other vegetables. As you move toward the Gulf region, gumbo takes the place of okra soup as the staple okra dish. North of the Gulf you might consider gumbo “soul food,”*** but it’s basically just Southern food (cajun/creole) across the border in Louisiana. Gumbo, which often uses okra as its key “thickener,” is probably the offspring of West African okra stew and French stews such as bouillabaisse. It’s generally served over rice. Since gumbo was a little “foreign” to our part of Mississippi, okra stew was the more common dish my grandmother would make. Despite being African originally, the variety of okra stew people make in the South isn’t particular to the black community. If I had to pick, I’d say okra stew is a little more common in “black” Southern cooking, whereas white Southerners might make fried okra more than okra stew, but people from either group might cook either dish. The soul food of one place isn’t necessarily the soul food of another, although it’s probably very similar – or even identical – to the general Southern food of the place it comes from. Rice dishes are way more prominent in soul food from the coastal Carolinas and the Georgia Coast, where most of the country’s rice was grown during the 18th and 19th centuries, although rice isn’t as fundametal to Mississippi cuisine. “Red rice,” for instance, is very popular in Savannah, where my dad’s family is from. It probably comes from the Gullah people — who live on the sea islands and the coast. You won’t find it in Mississippi, but it’s in the *Southern* cookbooks from Savannah. “Hoppin’ John” is another popular soul food rice dish from the Carolinas, but since I didn’t grow up in that area I’ve never had it before. When my mom was a kid, my grandmother fried catfish on Fridays. Catfish was the local fish; both black and white people eat catfish. In Savannah you have fish markets with many more options so people eat a wider variety of fish — usually still fried though. Southerners like fried things. Which leads us to fried chicken — that quintessential “soul food” staple and the meat dish that offended the sensibilities of many at a certain NorCal high school. Is fried chicken in and of itself all that offensive? Yes. It’s offensive to your arteries. But more than that, because of over a century of stereotyping, it carries a truckload of negative “minstrel” connotations of “coonery and buffoonery.” The correlation doesn’t stand to reason, but because it’s there, when black people eat fried chicken, the larger society labels that as “a silly thing to do,” more or less. “So it’s really true,” they’ll say. “Black people really do looove fried chicken. They just can’t get enough.” The same person may have had it just the day before, but because the stereotype doesn’t apply to him, he’s safe. Isn’t that ridiculous? Everybody likes fried chicken. Like french fries, pizza, and many other oily, salty things, it’s something you enjoy but shouldn’t eat all that often. Eating fried chicken isn’t just a black thing. It’s just a thing — a general thing. It’s Southern. **** If you go to Africa and hand someone a box of Popeyes, they’ll probably like it (I mean, it’s deep fried and salty), but they’ll probably tell you that it isn’t African. The variety of fried chicken we eat nowadays is much more similar to Britain’s “chicken fritters” than anything coming out of Africa; it probably comes from Scotland, England’s northerly neighbor with a penchant for battering and deep frying things you would have never thought to fry. Although Southern fried chicken may have a few more spices than British varieties, the whole “breaded and deep-fried in lard” thing is very northern Britain and probably came with those immigrants to the U.S.
Now, all that being said, there are some ways that black folks in the South traditionally eat fried chicken. In my mind it’s kind of a Sunday dish. After church, a family might gather at one person’s house (or the basement of the church itself, depending on the situation) and eat a full Sunday dinner of green beans, mashed potatoes with gravy, corn bread, black-eyed peas (maybe) and . . . fried chicken. Is there a Southern flavor to that meal? Yes. Is there anything all that “black” about any of the food items? Not particularly. You could find the same things on any table in the South. Now, I’m sure many black people would argue that the way you cook a meal makes it more black, but, like I said earlier, that kind of thing can also vary from person to person, and that level of nuance would definitely be lost on the school lunch program mentioned earlier. Could you make the meal a little more “black” by switching out some of the items? Well . . . yes. You could, perhaps, replace the string beans with collard greens and add candied yams to the mix; top it off with sweet potato pie for dessert and you have a meal that seems a little more black (soul food), even though its still definitely Southern and wouldn’t be all that out of place on a white Southern family’s dinner table. The traditional way of cooking greens takes hours, however, so you may not eat that every week. Some weeks, you may just have green beans. What makes the meal part of soul food “tradition,” however, is not only the items eaten, but how it is shared with family and friends at particular times throughout the year. Scholarly types have pondered the fried chicken Sundays tradition and have decided that the modern custom was forged in harsher times, when most black folks were field hands and unable to raise their own livestock. There is probably something to this. Even a sharecropper can keep a few chickens around and kill them for Sunday dinner. People have also tried to trace the tradition all the way back to Africa. Personally, I don’t totally buy that. People forget that nowadays, your average person eats meat much more often than he would have just a hundred years ago. Did many of West Africa’s various peoples make fried chicken on special occasions centuries ago? Definitely – but many types of meat were popular in Africa. For your average black Southerner in the 18th and 19th century just eating meat on your day off was part of the occasion. And that’s the heart of the Sunday fried chicken tradition in the African American community. Chickens were something that a lot of people had access to, and Sunday was a day that you could afford to kill some chickens and feed your family a good piece of meat. In more prosperous times, people kept the custom up and through force of habit it became tradition. Even though fried chicken on Sundays is kind of a black tradition coming out of Southern culture (a soul food tradition), fried chicken is also just a pretty common choice for Sunday dinner in the South — regardless of race. And in today’s world of restaurant chains and delivery service, people are just as likely to eat Olive Garden or Thai takeout as they are to do the traditional thing. It’s a brave new world. And it’s not like chicken has ever been the one and only entrée idea in the mind of the black race. Southern black folks eat plenty of other meats too: pulled pork, pork chops, bacon, ham, barbecued ribs, baby back ribs — most of the popular cuts of pork, honestly, and some of the less savory parts, traditionally (though less and less now that people are better off than they used to be). Go to a barbecue restaurant in any large Southern city and you’ll see plenty of both races. Watermelon was another offending food item mentioned in the school lunch article. Watermelon comes into season during summertime in the Deep South, so traditionally it’s a summer treat. Is it “soul food”? Well, it’s certainly something that black people eat in the South. White people eat it too, though. It’s just a common summer fruit. It’s like, part of picnic fare. Do black people eat it more? I’m not sure, honestly. Personally, I didn’t like it as a kid because of all of the seeds (the ones my grandma grew weren’t seedless) although most other people in my family ate it. Most white people eat it too though. And it’s not like watermelon is prepared really. It’s just grown, so you can’t call it a Southern or soul food “dish” as you would, say, sweet potato pie. It’s just another Southern staple – one of the “sweet tooth” variety, like sweet tea, which Southerners are known for sweetening to near-syrupy consistency. Most of the negative connotations associated with watermelon just come from its association with minstrel stereotypes. Which really gets to the heart of why soul food carries so many negative connotations, despite being composed of pretty innocuous fare, much of which is in no way foreign to the American pallet. Foreignness has never really been the issue. If it were just an issue of unique tastes, then saying “black folks looove fried chicken and collard greens” would carry the same weight as “Polish people looove sausages and sauerkraut.” The foods themselves are pretty common staples in the South, yet in the wider American context they’re correlated with black stereotypes perpetuated in popular media, and just eating the food reinforces those stereotypes instead of evoking childhood memories and encouraging tradition, as it is meant to. You often hear the axiom, “Stereotypes are based on truth,” but all the misconceptions around soul food show how stereotypes are oftentimes simply one group’s (flawed) perception of another group of people. As African Americans moved out of the South and into other regions of the country, the Southern fare they preferred for special occasions seemed especially particular to them, even though much of it was simply the type of food people of every race eat on special occasions in the South. Because the minstrel show and its derivatives in other popular media forms were the vehicles through which most Americans learned about African-American culture, the silly antics and exaggerated love of Southern staples like watermelon, fried chicken, and collard greens that characterize that genre all became correlated with African American people, so when a black person eats a Sunday meal of fried chicken and corn bread as part of an inherited cultural practice, a white passerby might see this and say, “Black people really do looove fried chicken,” while subconsciously affirming other stereotypes about general mental incompetence, stereotypes perpetuated by the minstrel shows. People tend to be sensitive about stereotypes that cast them in a negative light, which is why many black people were so upset about the Carondelet High School’s soul food school lunch, in spite of the school’s well-meaning attempt at honoring African-American culinary traditions for one day during Black History Month. Ironically, the foods that people were so offended by — watermelon, corn bread, and fried chicken — aren’t particularly “black,” despite being part of soul food tradition. Even in the South, there are foods that are seen as more or less coming out of the black community, such as okra soup, Savannah red rice, and Hoppin’ John, but these particular dishes aren’t universal, even within the Southern black community (except okra soup/stew arguably), so if you grew up in an area where no one made them, then they’re not really part of “your” soul food. Of course, there are a number of low-on-the-hog “cheap meats” that are more or less associated with black Southerners and soul food, but I would argue that most Southerners who couldn’t regularly afford the more expensive cuts ate the cheaper stuff at least sometimes, and they’re only associated with black folks in particular because black people tend to be the face of Southern poverty. More and more people are eating “high on the hog” these days, however; you don’t see as much of the other meats on your average dinner table — not regularly anyway. Some people might argue that collard greens are definitely a black thing, especially when they’re stewed for hours with vinegar and ham hocks. Even though you see “other folks” eating them, they’ll say, black folks are the ones who really know how to make them. Maybe so. Collard greens are certainly soul food — and Southern. The vast majority of foods that people eat in the South aren’t “coded” particularly black or white, however. Corn bread, johnny cakes (hoe cakes), teacakes, baby back ribs, pulled pork, barbecue, biscuits and gravy, grits with bacon, potato salad, deviled eggs, country fried steak, chicken and dumplings, boiled peanuts . . . it’s a long list, and some of these staples aren’t even all that Southern — they’re just American. Your classic cakes, for instance, also have a place in Southern and soul food traditions, since people eat them on special occasions. My grandmother used to make pound cake and German chocolate cake over the holidays. Obviously German chocolate cake didn’t come from Africa. Western Europeans are more responsible for modern cake-making processes than West Africans, yet cakes have become an important part of traditional meals in both black and white communities. The difficulty of parsing out what is particularly “soul food” from what is simply “Southern” is indicative of how the food culture in the South is a kind of stew, with many people cooking dishes that may have had origins in the food cultures of other races. In a region fraught with historical tensions and racial violence, food culture is an area of Southern culture where people have regularly borrowed from others, making a few changes here and there, perhaps, to more clearly make these dishes their own. Despite the tendency to want to claim certain foods as “ours” versus “theirs,” the food culture in the South is one aspect of Southern culture where both black and white people have a lot in common. *I use the term “garden” liberally here. She called it her “garden” but it was at least half an acre. *** The food and culture of the Mississippi Gulf is a lot more similar to southern Louisiana’s. ****Case in point: Chick-fil-a. Once just a Southern chain, it has now spread to many other regions of the country. Even in the South, however, a lot of the restaurants are situated in areas where the majority of customers are white. They’re not just going there for the waffle fries y’all! They’re eating chicken. Fried chicken. 2 Responses to You Can’t Spell “Southern Food” without S-O-U . . . well . . .
That was a good post. I got hungry reading it. And by the way, Justin had fried chicken from Ruchda’s today, and mom bought me some collard greens from Whole Foods to cook tomorrow. That’s right, we bought the black soul collard greens from the verrrrry white store Whole Foods. Collard greens and hot sauce for anyone?